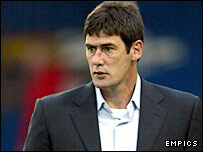 Luton boss Mike Newell is to sign a new four-year deal with the club. The announcement will end speculation linking Newell with the vacant manager's position at Leicester. Hatters chairman Bill Tomlins told the club website: "I am pleased to confirm that the club's offer of a new four-year contract has been agreed. "It will be signed after consultation with Mike's solicitor. I believe this commitment reflects Mike's belief he can achieve his ambitions with Luton." Newell was hotly tipped to take over at Leicester following the departure of Craig Levein in January. And even after publicly stating he wanted to stay at Luton, the rumours linking Newell to the Leicester post continued. Tomlins added: "Even when speculation was rife, Michael always indicated his desire to stay with us. His record here speaks volumes."